Offering an array of tavern and roadhouse Mexican, Billy Blanco'smakes you feel like you're in a real working garage. On the menu, you’ll find an array of tavern and roadhouse Mexican food choices from barbecued ribs, fried chicken and mashed potatoes, to tasty tacos and delicious enchiladas. Complete with cars and motorcycles on hoists, a 50-seat bar made of toolboxes and more, you'll feel like you’re in a real working garage at Billy Blanco's. Blanco's will make you feel like you're in a real working garage. 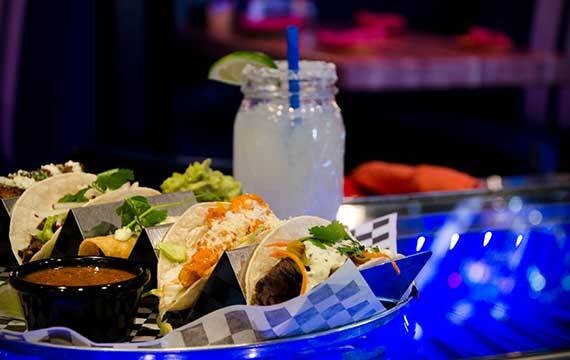 On the menu, you’ll find an array of roadhouse Mexican food choices from barbecued ribs, fried chicken and mashed potatoes, to tasty tacos and delicious enchiladas. Designed as a private collector’s garage, Billy Blanco’s VIP Garage the perfect venue for parties, group events, corporate functions, and meetings. Offerings include plated or buffet menu options, bar options, and media wall access. Seat your group under lifted collector’s cars, and provide your guests with an experience they won’t forget.